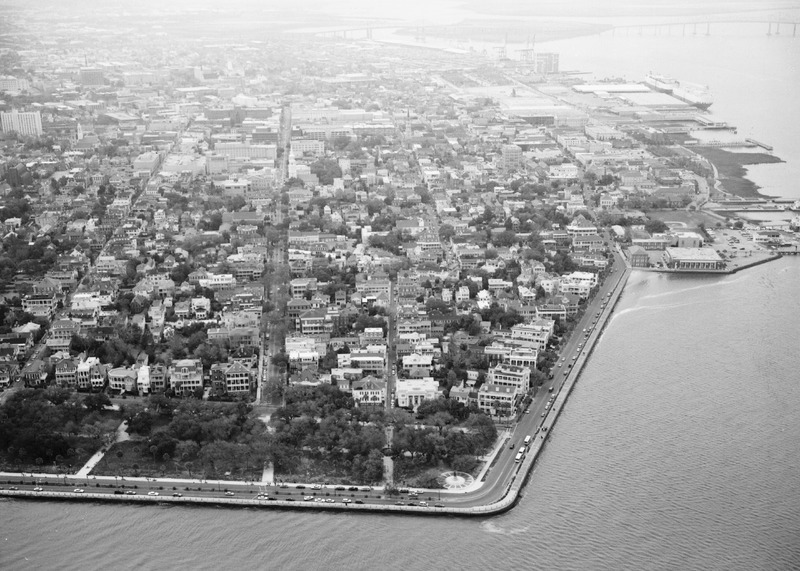 Aerial view of Charleston, South Carolina, c. 1930s, courtesy of the Library of Congress. "Proceedings of the Friendly Moralist Society," Charleston, South Carolina, August 11, 1856, Friendly Moralist Society Records, courtesy of the Avery Research Center. The Friendly Moralist Society was a benevolent society estabished in 1838 for Charleston's free men of color. 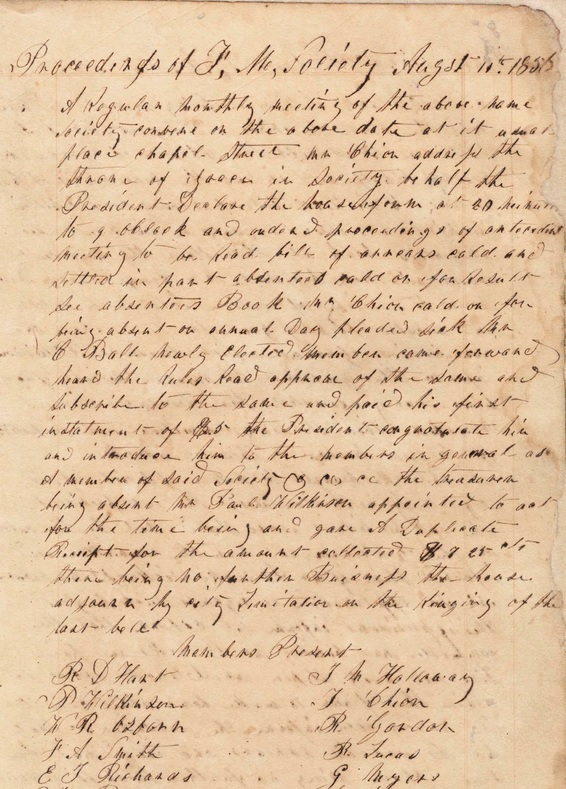 Their records, held in the Avery Research Center's Archives, serve as an example of the rich, but often under-researched, document trail left by free people of color in Charleston's antebellum period. The richness of Charleston’s archives connects inextricably to the institution that drove its economy before the U.S. Civil War: slavery. The business of Atlantic World slavery required extensive documentation, as did the generational transfer of wealth among white families who prospered from it. In December 1860, Charleston’s white elites led South Carolina, and ultimately the South, out of the Union to protect American slavery and the wealth and power it produced. Yet in the antebellum era, white Charlestonians were not the only ones who left their archival mark in the city’s history. According to the 1860 United States Census, Charleston was home to nearly four thousand free people of color, equaling roughly eight percent of the city’s population. Members of this relatively small but significant community inserted their presence into the documentary record by acquiring property, establishing successful businesses, and founding schools, churches, and literary societies. Individuals from the city’s large enslaved population—nearly thirty-six percent of all Charleston residents in 1860—also developed significant economic and social networks within and outside of the surveillance of white slaveholders by bartering skills and wares through the hiring-out system and in urban markets. Enslaved men, women, and children in Charleston and the surrounding Lowcountry region also carved out meaningful lives, though archival records based on literacy and the written word rarely document their experiences or points of view. After the Civil War, Emancipation and Reconstruction broadened the circle of influential African Americans in South Carolina. Black officials elected during Reconstruction and their white allies dramatically reshaped public policy in the state by passing laws guaranteeing universal male suffrage, expanding women’s legal contract and property rights, establishing a free public school system, and barring racial discrimination in public transportation and accommodations. Meanwhile, grassroots African American community members founded churches, schools, mutual aid societies, newspapers, and militias to train their future leaders, promote their autonomy, and defend their freedom. They also instituted public memorial celebrations so that the sacrifices made by so many to ensure freedom and citizenship for all would not be forgotten. 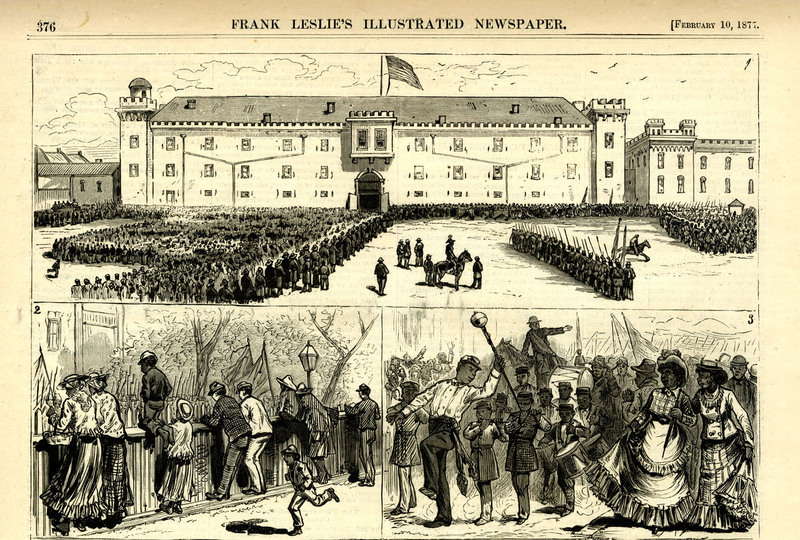 Celebration of Emancipation Day in Charleston, South Carolina, Frank Leslie's Illustrated News, February 10, 1877, courtesy of the Charleston Museum Archives. Yet the post-war political battles that brought an end to the federal government’s occupation of the former Confederacy greatly affected how slavery and the Reconstruction era were remembered. The restoration of white southern political leadership left subsequent generations—particularly white Americans—with little, if any, awareness of the region's history of African American activism. By erasing the contributions and struggles of black Charlestonians in popular narratives of the city’s “glorious” antebellum past, and marginalizing attempts by black leaders to establish an interracial democracy during Reconstruction, white leaders legitimated white supremacy and black disenfranchisement in the decades following the Civil War. The emergence of Jim Crow laws in the late nineteenth and early twentieth centuries institutionalized power hierarchies based on race, class, and gender, and reaffirmed white control of public resources. Segregation also served to cement these southern power hierarchies in public memory. 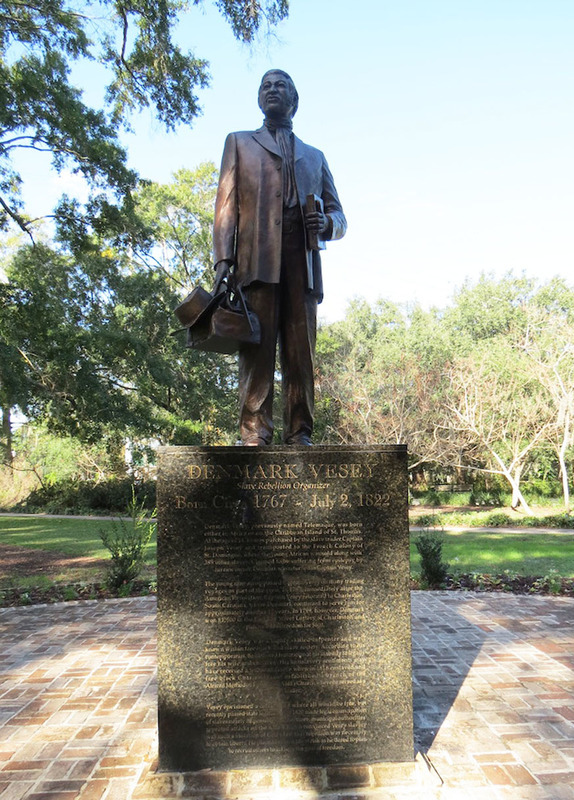 The Denmark Vesey “Spirit of Freedom” Monument, photograph by Emily Pigott, Charleston, South Carolina, November 2015. Located in Hampton Park, the monument was unveiled to the public in 2014 to commemorate Vessey’s anti-slavery rebellion plot, which ultimately failed in 1822. In too many ways, Charleston’s current public history landscape continues to struggle with overcoming the long term marginalization of African American history—though there has been some noteworthy change. In 2016, the Charleston Visitors Bureau’s website announced no less than six historic tours under the label “African American/Ethnic” and includes a link to a separate page on local African American history. The first category listed in the latter is “Famous Folks and Important Facts.” The web page’s timeline stretches back to the sixteenth century, and chronicles events such as the Stono Rebellion in 1739; the Denmark Vesey rebellion plot in 1822; the founding of the city’s first NAACP chapter in 1917; and the 1999 erection of a marker on Sullivan’s Island to memorialize the thousands of enslaved Africans who disembarked on the site during the eighteenth and nineteenth centuries, when Charleston served as the dominant North American port in the trans-Atlantic slave trade. Despite these significant points, many crucial events and figures remain absent from the timeline, particularly those active in the twentieth century civil rights movement. In addition, not a single woman appears on the list of “Famous Folks” in Charleston’s African American history. Equally troubling is the ongoing segregation of historic narratives in various public history sites throughout the Charleston area. African American heritage tourism appears to constitute a unique market niche rather than a central feature for understanding Charleston’s history.